Last weekend, I went away with strangers. Well, not just strangers. 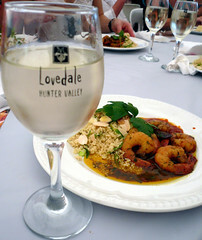 I went away with my ‘foodie’ friend, Simon, who organised a group of us to go to the Hunter Valley wine region for the Lovedale Long Lunch. 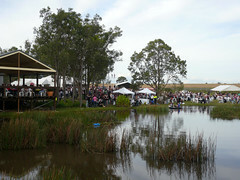 Lovedale is a region within the Hunter Valley, and each year a handful of wineries throw a huge lunch. People come, they eat, they drink, they indulge in general merriment, then they pile into cars and buses and drive to the next winery where they do it all again. As well as Simon, there would be Shona and her husband, Dan, and best friends Pelagia and Pat. And they would not be strangers for long. It being my birthday weekend, I thought that the LLL would be a terrific way to celebrate. So, I packed my overnight bag, ate a light breakfast, picked up Simon and we drove the 160kms to the town of Cessnock in the Hunter Valley. 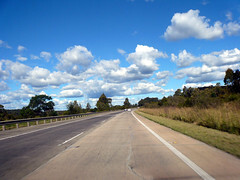 We took the scenic route, which was definitely scenic, but had Simon begging me to return to Sydney via the motorway the next day. Windy roads = nauseous passenger stomach. I slowed down a bit, which did not detract from the stunning drive. The sun was breaking through the trees and burning the dew from the grass. Cows and sheep looked up from their breakfast as we drove past. 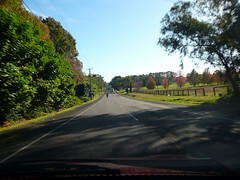 The road was nearly empty, except from a few motorcyclists who must have been loving the curvy roads. 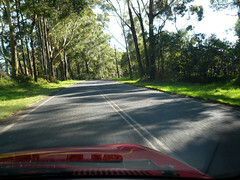 We drove through the tiny town of Wollombi, where the ‘outback’ has crept towards the city. I wanted to stop and explore this testament to times gone by, but we were on a deadline – there was eating to do – so I will have to go back soon. 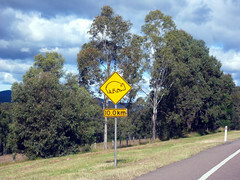 Minutes later we were in Cessnock. Ahhh, Cessnock. Yup, that’s all I have to say about that. 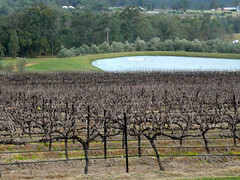 Nothing much going for this town except its location – right in the heart of the Hunter Valley wine region. There are some shops, some houses, and no character whatsoever. 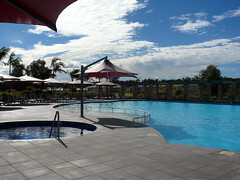 We were staying a motel, which was clean and nice enough, and filled to the rafters with other Lovedale Long Lunchers. We dropped our bags and drove out to the first winery of the day: Emma’s Cottage Vineyard. As we pulled in the driveway, we were greeted by people dressed as pirates, a theme that was never repeated throughout the day, and baffled us a little. We parked, walked past a small family cemetery, and joined up with the excited crowd of people milling around the entrance. $25 got us a meal, a glass of wine, and our wine tasting glass for the day. And then I met my new friends. It was that sort of meeting where I knew right away that we would all have a brilliant time, as we were laughing together within minutes. I had made 4 ‘five minute friends’, new friends that seemed like old friends within minutes. Pelagia and I even discovered that my next door neighbour is one of her best friends, which was really trippy, because Sydney has 4 million people in it – what are those odds? We spent the rest of the day at three other wineries, where we shared bites of delicious meals, and drank tasty Aussie reds and whites. 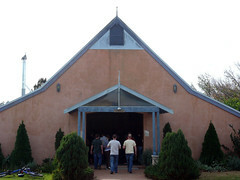 Each winery showcased its wine and its setting, as well as teaming up with a local restaurant and local producers. 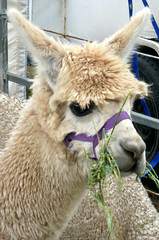 We planned ahead from our menus, but after two lunches and a dessert, all I could do at the last winery of the day (Gartelmann Estate) was taste wine, gawk at the increasingly ‘sloppy’ crowd, and talk the penned alpaca (cute!). At five we wrapped up our long lunch (6 hours) and headed back to our respective accomodation. Shona and Dan were at the Crowne Plaza (NICE! ), and Pat and Pelagia were at Pepper’s Resort (nice in a ‘nana’ sort of way). Simon and I drove to the Comfort Inn in beautiful Cessnock, where we stayed for approximately 27 minutes before going to visit Shona and Dan at the Crowne. We took cocktail stuff and settled in for the evening. I know it may be hard to believe that we wanted to drink anything else that day, but we did and it was my birthday, so we had a room party with gin and tonics and chips from the mini bar. We laughed about stupid stuff, and shared details from our lives, consolidating our ‘5 minute friendship’. And then we went to spa! I had forgotten my swimmers and so had Shona, so we donned knickers and tank tops, and wrapped ourselves in fluffy white robes. With Simon and Dan in board shorts, we four strolled through the hotel lobby like we owned the place and went ourside to the pool area. A young couple was in the spa, so we would have to share. I was more concerned about the rain. For me, it was too cold and too windy to show my knickers in public. I dangled my feet while the others shivered in a semi-warm spa and avoided the (we soon discovered) naked couple on the other side. It was a quick spa session, but our little gin-steeped adventure, and fun. After quick showers and freshening up we went to meet Pat and Pel at the local pub, an Irish pub, which was huge and stuffed with people. We commandeered a table, and ordered light meals. Well, no that is a total lie. We ate pizza and sausages with mash, and a Caesar salad. You would never have known that we had eaten all day. Then, I was crashing. I don’t know whether it was the long day of driving, drinking and eating that made me want to curl up and sleep on the pub floor, or the fact that I was another year older. I am a partier, but I was pooped. The night continued a bit longer; I know there was some dancing (not by me), a visit to Pat and Pel’s room (at Pepper’s Retirement Village – I mean, Resort) and a dingo sighting on the drive back. Then, at about 11 and with much relief I climbed into the starchy white sheets of the Comfort Inn. I’d had a full and fun birthday, and met four lovely new friends, and broken bread with my favourite foodie, Simon. I had also spoken to my parents, and my sis, and the next day I would get to talk to Ben. Yes, it was a lovely way to celebrate my 39th! The next day we were going to do it all again – this time three wineries and a stop at Tempus Two were on the cards. I was completely for all of that, except for one thing. I hadn’t gotten to talk to my favourite boy. Long distance love means Ben is 15 hours behind Sydney time. I wanted to talk to him so much, I said my goodbyes after the first winery of the day, and made the drive back to Sydney along the motorway. I know from photos sent on by Shona and Simon that they all had another brilliant day, including a stop at the cheese factory. I am happy that they did, especially as Shona, Dan, Pat and Pel are all parents and do not have the chance to getaway as often as I do. And I am sorry I didn’t get to say a proper goodbye to Pel and Pat, but I will hopefully see them soon. And me? I cannot wait to get back to the Hunter. I hadn’t been there since 2003, and quite frankly, that is just too long between drinks. Next time, I will take Ben so he can see the wide blue skies, the beautiful bush wineries, and taste some of the most delicious wine in Australia. We might even see a wombat in the wild. Oh, and we are sooo staying at the Crowne! 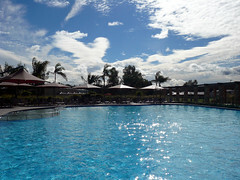 I want to go to the Hunter Valley now (or at least to Margs for the weekend!). Great post. Sounds like it was a blast.